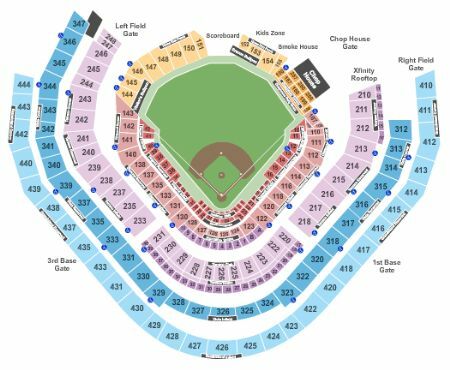 Atlanta Braves vs. Philadelphia Phillies Tickets - 7/2/2019 - SunTrust Park in Atlanta at Stub.com! XFER Mobile Entry. Scan your tickets from your mobile phone for this event. Tickets will be ready for delivery by Jun 28, 2019. $10 food and beverage credit included with each ticket. Tickets will be ready for delivery by Jun 28, 2019. Access to the Delta Sky360 Club includes VIP entrance, in-seat wait service & all-inclusive food and beverage (excluding hard liquor). Tickets will be ready for delivery by Jun 28, 2019. Delta Sky360 seats include All-Inclusive Gourmet Buffet featuring Draft Beer, House Wine & Soda, Complimentary In-Seat Food and Beverage Service & Access to the Delta Sky360 Club. Mobile Entry Tickets. Must have smart device on hand to enter event. Do not print these tickets. VIP Area/Club/Lounge access included. Tickets will be ready for delivery by Jun 28, 2019.